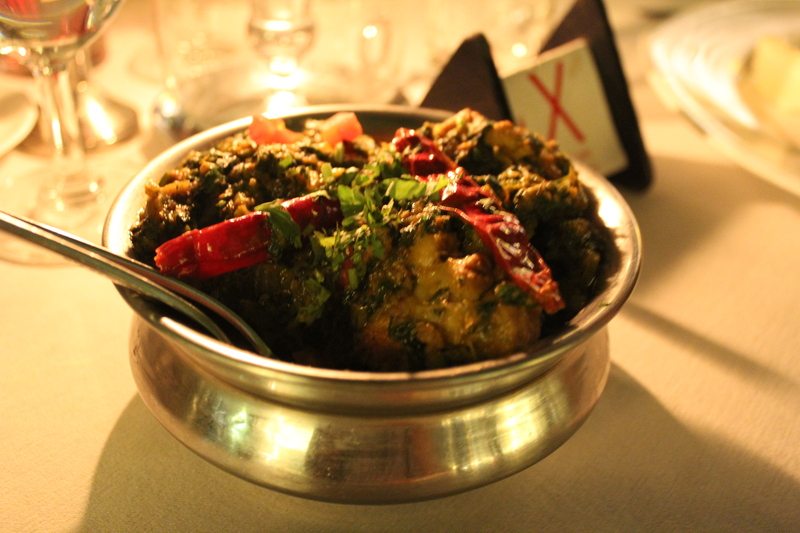 Also called Saag Paneer, “spinach cheese”, this dish (as well as its more meaty variants when we could find them!) quickly became one of our go-to dishes in the strongly vegetarian climes of North India. There’s something really vibrant about the gorgeous green colour and it makes you feel like you’re eating some vegies! You can buy paneer from most supermarkets/Indian grocers; alternatively, you can make your own really easily, using the recipe we provided on our blog How to Be the Perfect Indian Wife. Boil the spinach for two minutes in a cup of water. Allow to cool, then puree until smooth. Cube the paneer and put aside. Heat the oil in a deep fry pan and add the cumin seeds. Once it starts to splutter, add onions and sauté until slightly golden. Add ginger and garlic and sauté until the ‘raw’ smell disappears. Add the tomato puree, spices and salt. Cook on medium heat for about 5-6 minutes. Add the pureed spinach and paneer. Let it simmer on medium heat until the paneer is a little soft. Add some water if it’s too thick. Add the yoghurt, curd or sour cream then turn off the heat. Serve hot with chapatti, roti or whatever carb-y goodness you so desire!